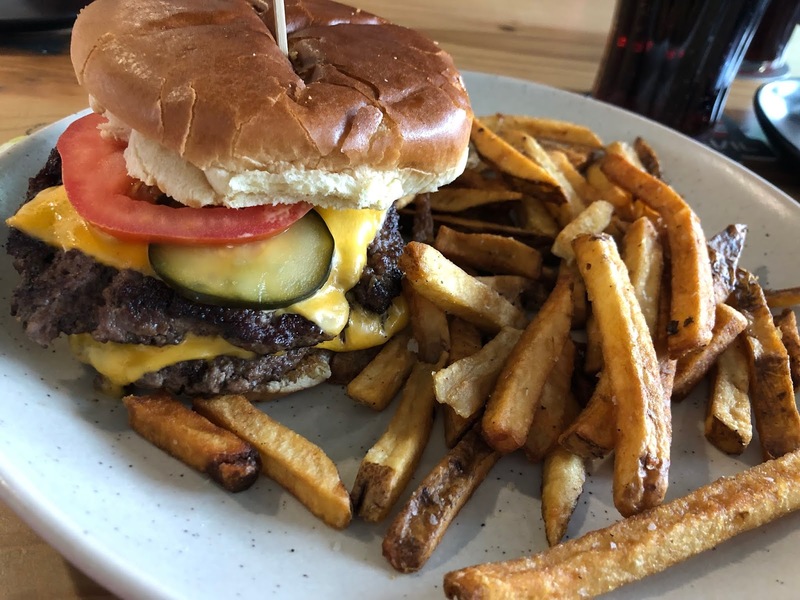 The newest addition to the Sahm’s empire is Half Liter, which is a Texas-style BBQ place that is in the back of Liter House on the Monon. It’s an impressive huge high-ceilinged place with vary casual picnic style tables. Downstairs there are only the benches and tables, but I think upstairs has some regular tables with chairs with backs. The one weird thing is I still don't know where the "front" door is on this place. I ended up going in through the patio because the door by the parking lot that said enter here was locked. It’s a cool place though and it was packed for a midday lunch (but not so packed we didn’t get a table right away). The concept is Texas dry rub BBQ and they serve several different BBQ sauces on the table. 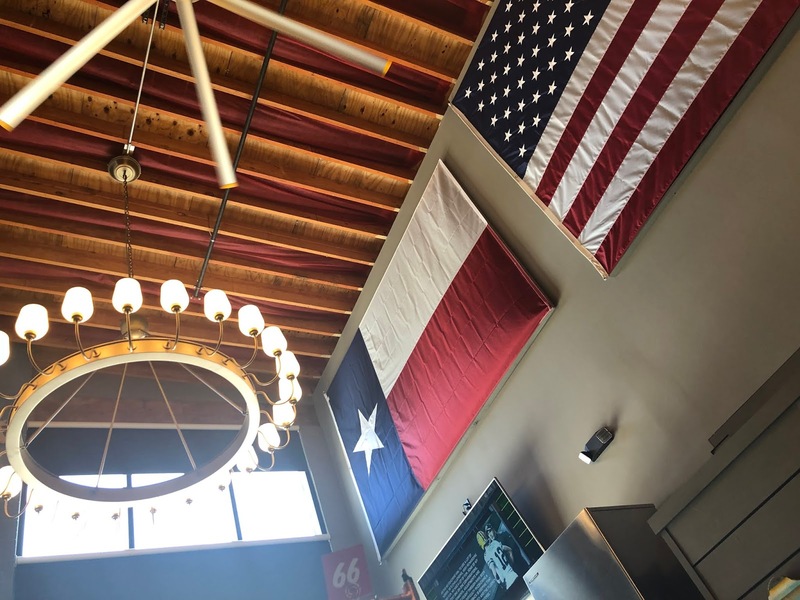 They have a Carolina-style mustard sauce, a traditional Texas style red sauce and a sweet, Dr. Pepper-based sauce. 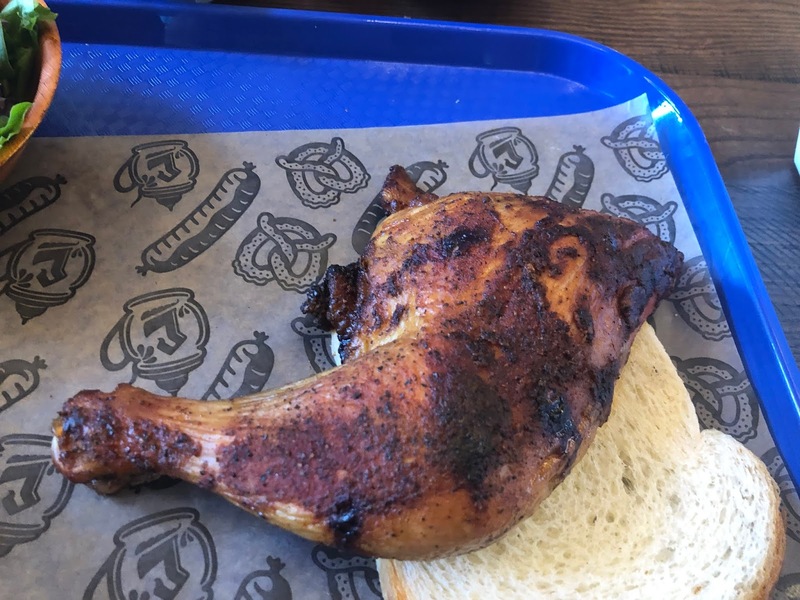 I ordered a quarter chicken leg for my lunch ($7) and it came with 2 sides. 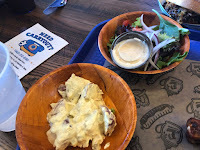 I went with potato salad (because I always try potato salad whenever I try a BBQ place) and a green salad because I was feeling peckish for something green. The chicken was really, really good. I always worry that it will be horribly dry, but this chicken was anything but. It was so, so good. Super moist and with a ton of smoky flavor. It was a big leg/thigh quarter and it was a great lunch portion for me. I would be hard-pressed not to order the exact same thing again. Seriously, really good. As for the sides, the potato salad was a no-go for me. I am weird about potato salad and when I like it, I really like it. And if I don’t like it, I just don’t. There’s no middle ground. This one had celery in it, which isn’t my favorite, but it also had a certain sweet flavor I didn’t care for. Like I said, I am super weird about potato salad. 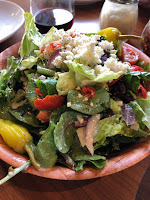 Although my green salad was simple—just fresh lettuce, red onion and tomatoes. They only have like 3 choices for dressing (again one of the choices is Dr. Pepper flavored). I went with ranch and was happy I did—it was really tasty—not just ranch but ranch with some spicy kick to it that went well with the BBQ. 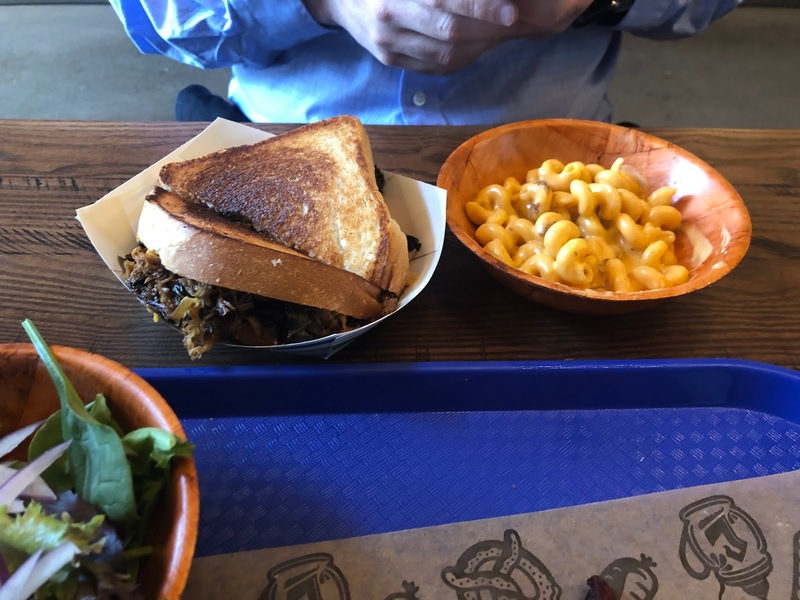 My friend had the Eddie’s melt sandwich ($10) with one side. The sandwich was really interesting—it had pulled pork, collard greens, pimento cheese, and caramelized onions It was something I am not sure I would have ordered before, but really enjoyed. His mac and cheese side was the superior of the two hot sides for sure. Not fancy or anything, but really good. We also got to try the cornbread and the waffle fries randomly, because I guess they made a serving of them on accident and because we were by the service window, they gave them to us. The waffle fries were good waffle fries—I liked that they made them a little unique with some extra seasoning. 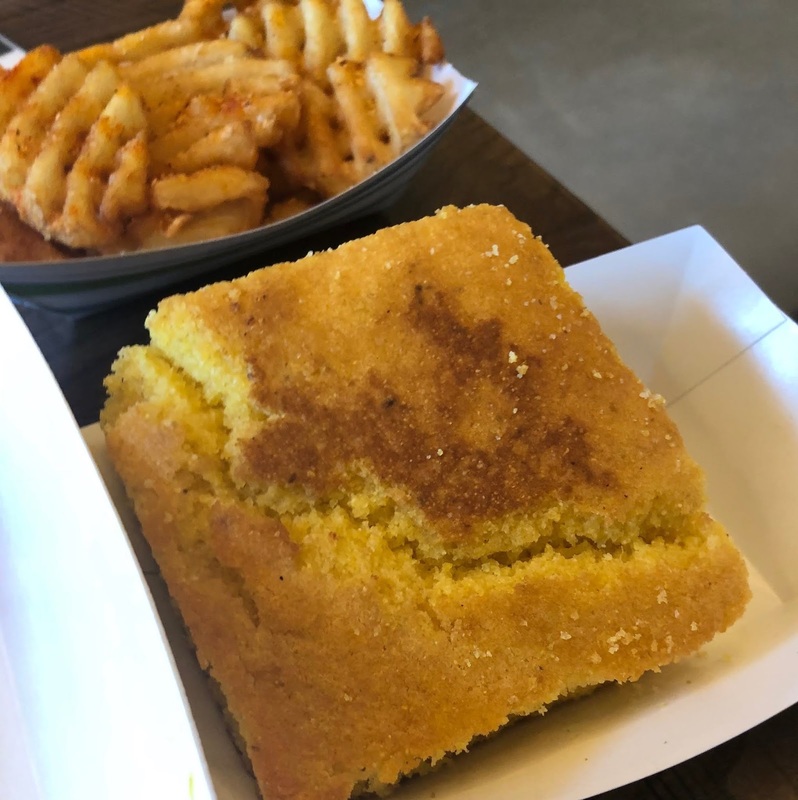 The cornbread was a nope for me. So dry and crumbly it bordered on sandy. But it was nice to have the opportunity to try them out. All the meat I tried (which sadly wasn’t a ton) was spot on. Had a good deep smoky flavor and was very tender. The sides were kind of hit or miss—honestly, I would likely go for the mac and a salad again because I liked the dressing so much. There are several other options to try. And of course you can never go wrong with tots. I am looking forward to going back with more people and trying some more of the meats. Hubby can’t wait to try the brisket. Anyone had it? Recently I found myself in Brownsburg at lunch time, and this is not an area I am familiar with, so I took to the twitterverse and asked for help. I got several good recommendations, but settled on Thai Basil, as recommended by @thejoeball. There were actually several spots that were tempting, which I was surprised by, but Thai food sounded good. It’s a cute little place with table service—although for some reason, it took quite a while to place my order and get my drink. They were decently busy, but not super busy. But eventually I put my order in for my very favorite Thai dish—the sautéed eggplant with chicken. Here they call it “Tasty Eggplant” ($11.99). They have a bunch of lunch specials that run $8.99 and come with soup and an eggroll, but no tasty eggplant on the lunch menu, so I just ordered off the dinner menu. They first brought me a small bowl of Tom Yum soup—it had a great lemongrass flavor and a hit of spiciness from red chili. There were some hunks of carrot and some fresh cilantro on top. I really liked it and had a hard time not eating every last drop. It did have a spicy kick to it. 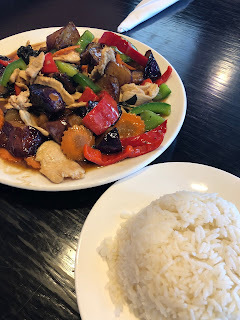 When the tasty eggplant came out, the first thing I noticed was how much like a rainbow it looked when they placed the dish in front of me—the purple eggplant, red bell peppers, green bell peppers, and orange carrots. There were also big leaves of basil mixed in. The other thing I noticed with my first bite is that it was smoking hot! Not spicy, but temperature-wise. It was crazy how hot it was. 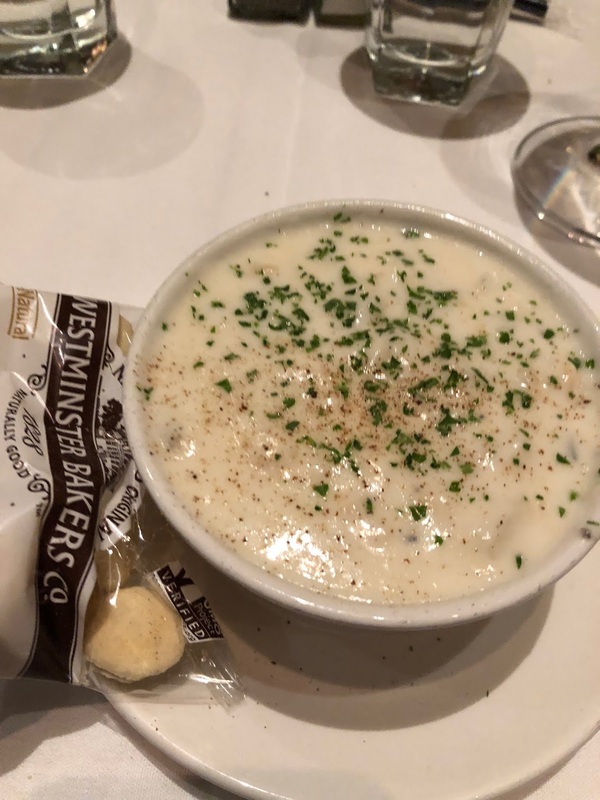 I had to let each bite cool before I could eat it—but when I did eat it, it was delicious. The chicken was nice and tender, and the sauce had a lot of flavor from the basil and the gingery brown sauce. Again, I had a hard time not eating all of it, but trying to be somewhat healthy, I restrained myself. The veggies were crisp but tender and I love the way eggplant soaks up all the flavor in the stir fry. All in all, this was a tasty lunch and if this were my town, I would probably put it in the rotation and try some other things as well. All you Brownsburg, folks, what do you think? And what are your favorite places? A neighbor recently brought a Pots and Pans pie to my house, and then another friend mentioned it again, and I realized I needed to check it out more fully when I heard about all the savory options they have. 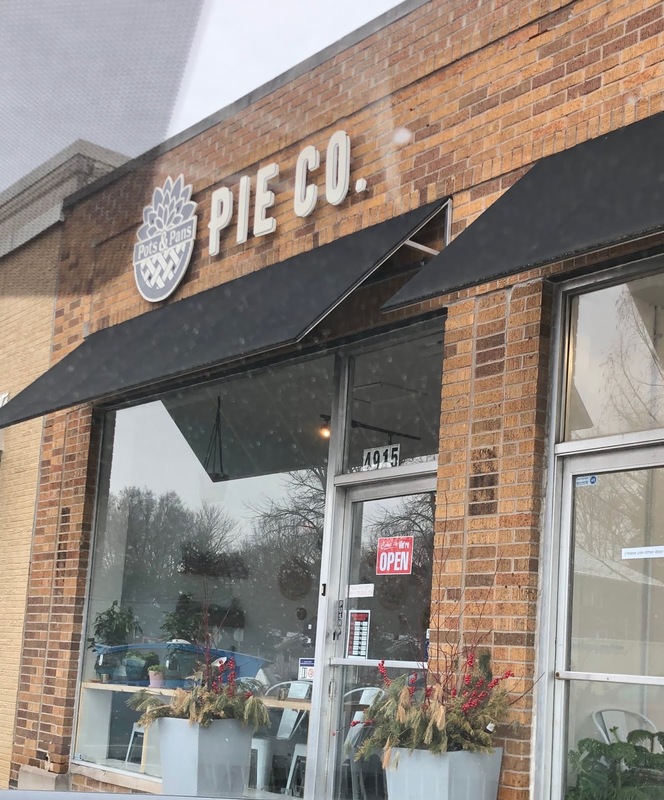 I will admit, there are only a few sweet pies that really wow me, so I was a bit slow until I heard about the savory options. 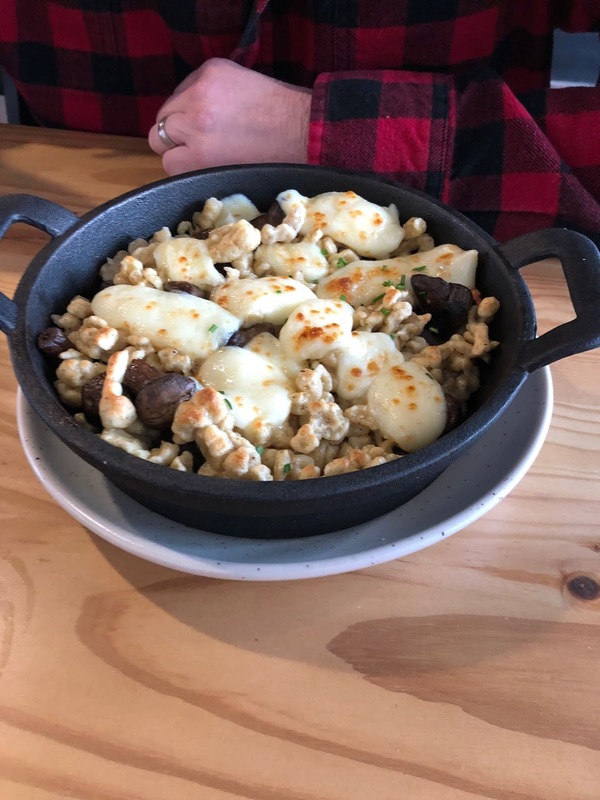 Each day they offer a fresh hot selections (one pot pie and one gallette) and then you can order frozen versions to cook at home as well. One Sunday hubby, my daughter, and I headed over to have brunch there. It’s a tiny little place to eat in, but they do have a few tables. 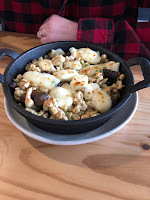 And they only have a few hot options each day, but on this day, it was biscuits and gravy individual pie ($8) and the goat cheese and caramelized onion gallette ($6). 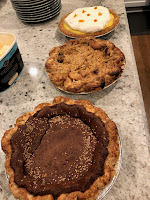 The thing about these pies is the crust. Man oh man—it is so light and flakey, but yet rich and buttery all at the same time. The crust alone is worth eating the pie. Then when you throw sausage and sausage gravy inside it, you have the makings of something truly delicious. Hubby was over the moon and it was hard to get him to share at all, but he did. 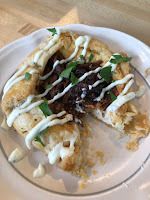 The gallette was also very good- not quite as filling as the pie because there is less crust, but because of the richness of the toppings—there was a layer of goat cheese in the bottom crust and then caramelized onions on top—it was still extremely rich and satisfying. 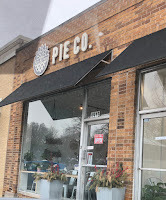 It was a little more unusual I guess, but honestly, I can’t even say that because I had never had biscuits and gravy pie either. Both were very good. You can feel that every bit of these pies is homemade, and fresh. I would eat that biscuit and gravy pie any day. So I decided to order some sweet pies for an upcoming event I was hosting, and went with the chocolate tahini, “Bruce’s lemon pie,” and the apple crumble (full sized pies are $25). Again, the crust is so, so good. My favorite was probably the chocolate tahini, because I liked the nutty flavor from the tahini, but without having nuts in it, which my son with the nut allergy appreciated. It had that little bit of umami that I love in a sweet dessert. The lemon pie was also very tasty, it had a nice tanginess to it that I appreciated. 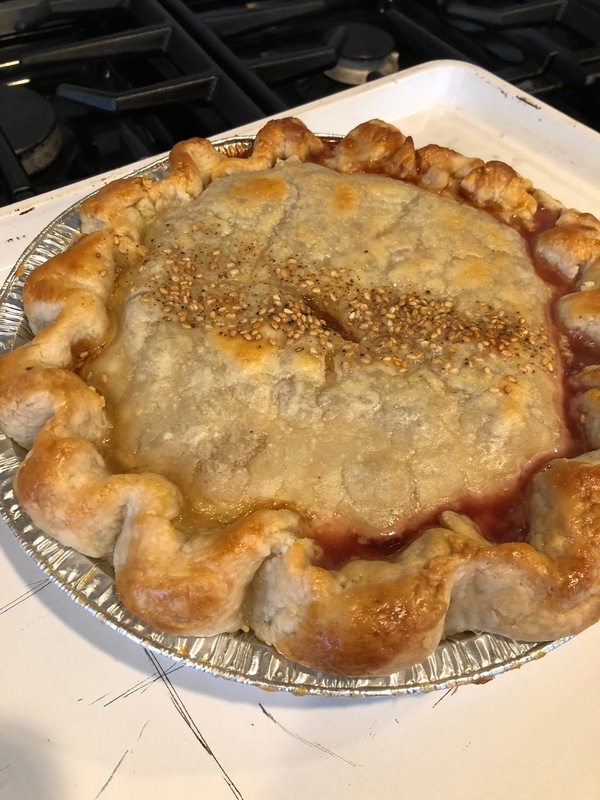 The apple was good too, but apple tends to not be my favorite pie overall and this was less exciting. 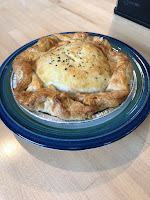 And overall, I definitely preferred the savory pies, but as I mentioned already, that’s to be expected from me. I think hey are just more interesting all around. With all that said though, we ordered a full-size frozen “taco truck” pie to take home and cook at a later date for dinner. Based on everything I had eaten, I was really excited about this and served it for family dinner one night. However, this was not a big hit. Again, the crust, as always, was delicious, and heated up nicely from frozen (except for a few edges that were broken straight out of the box). 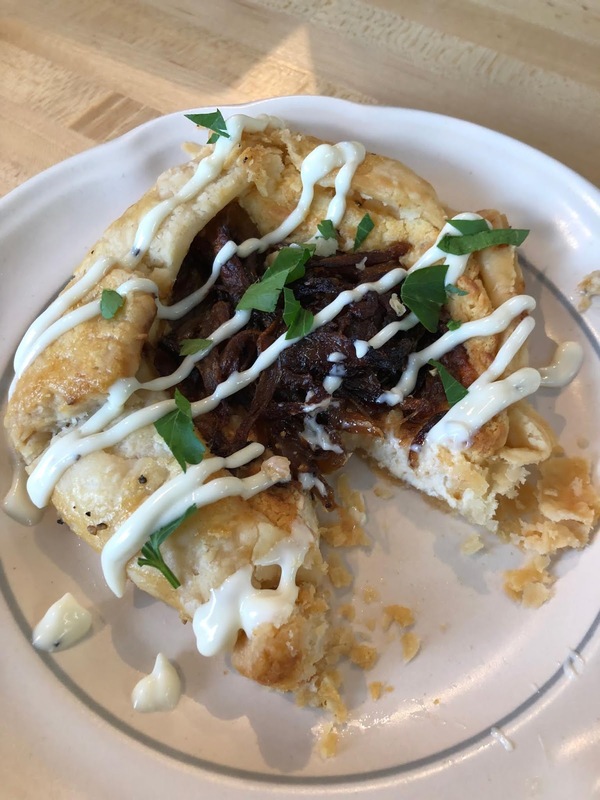 However, the filling for this pie probably should have been called something like “Asian taco truck” or something, because it was very different from what we expected. It was filled with pork shoulder, and lots of Asian veggies—bok choy, cabbage and had a much more Asian flair to it than we were expecting. 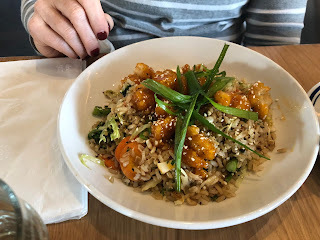 It was much more veggie centered than we expected as well. I was sort of expecting more of a Mexican/Latin flavor and none of us particularly cared for it. Oh well, you win some, lose some. But I would try a different one in the future. And I appreciate the crust to filling ratio of the individual pot pies better as well over the larger versions. All in all, a nice little addition to our local food scene—something different. Honestly, I would love to just try the straightforward chicken pot pie as well. And there’s a bacon and egg gallette that’s calling my name. So who else has been and what have you enjoyed? I need details. 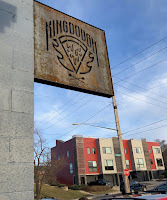 So I kept on seeing all the hype on the interwebs about King Dough, and to be honest, I had my doubts about how good it could really be. But naturally, my interest was piqued and so we headed over there to give it a try. It’s on the east side of downtown, in what looks like an area that is revitalizing currently. A lot of new housing etc. 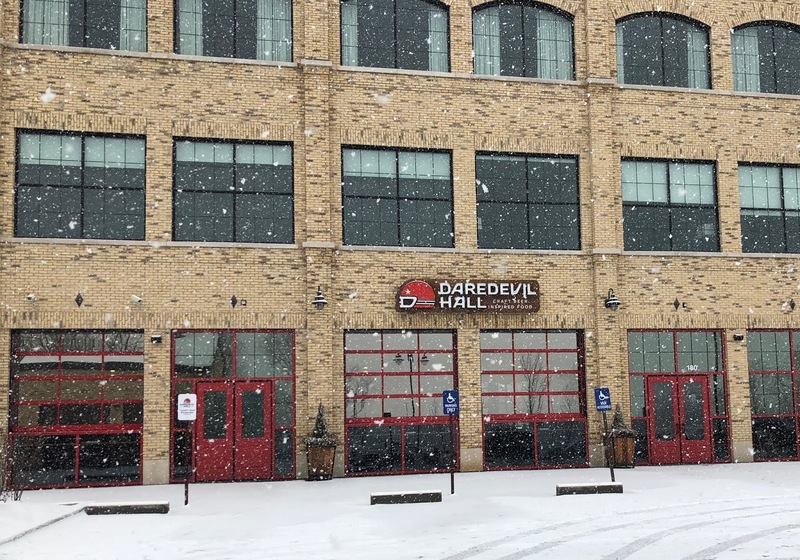 It also has a nice outdoor area that people were standing in on one of our rare sunny days lately, but which will be very nice once we have actual reliable warm weather. They were quite busy at around 6:30 on a Saturday, but even though they initially told us it would be a 15-20-minute wait, we actually got seated immediately. Unfortunately, I think this was maybe not the best for our server who was a bit in the weeds, and our service suffered all night because of it. Anyway, we started with the Greco salad ($9 for small, $15 for large), which was chopped lettuce, spinach, and mixed greens with olives, cherry tomatoes, red onions, peppadew, and pepperoncini. It also had crumbled feta cheese and a great zesty Italian dressing (lemon basil vinaigrette). (It comes with green bell peppers too, but we got it without.) This was a fabulous salad and exactly what you want in an old-school Italian salad. Lots of little bits of flavor with a super tangy dressing. The picture you see is the small, which I think easily serves 2-3. I ate slow because I wanted to save some to eat alongside the pizza. 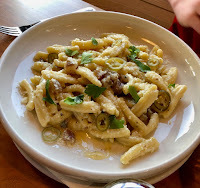 My son ordered the casarecce carbonara ($15), which came out next (they apparently just bring things out as they are done, so plan accordingly). It was the pasta topped with a light, but creamy carbonara sauce—which is mainly egg and some parmesan cheese with hunks of bacon and some sliced pickles habanero peppers on top. They use cured egg yolks as well. The peppers were unnecessary and a bit hot (if they were more pickly and less hot I would have been into them), but the pasta dish was excellent (we picked off most of the peppers). Seriously, this is one of the better pasta dishes I’ve had in Indy in any restaurant, Italian or not. 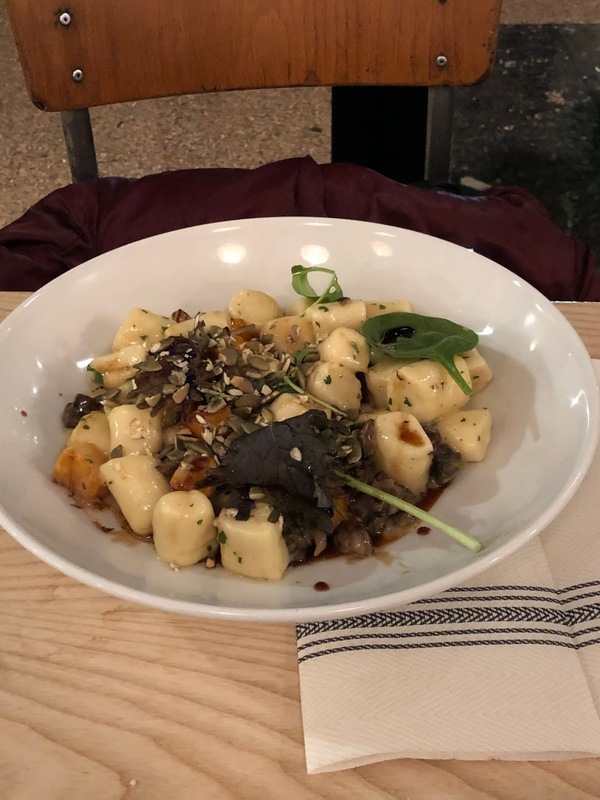 The pasta is cooked just right, and the sauce isn’t so overwhelming that you want to stop eating it after a few bites. We all happily ate off of his dish. I would love to try all the pasta dishes---and I saw the polenta with meat sauce on another table as well and it looked amazing. Sadly, they were out of the first choice my son wanted (pappardelle Bolognese) but he was very happy with his second choice. Hubby and I debated which pizza to get for a long time—he really wanted a meat-full pizza and I really wanted the “stinky pete.” I won this battle and we got the stinky pete ($16.50). So this is a pizza with mozzarella, goat and gorgonzola cheese—there is no red sauce on it. 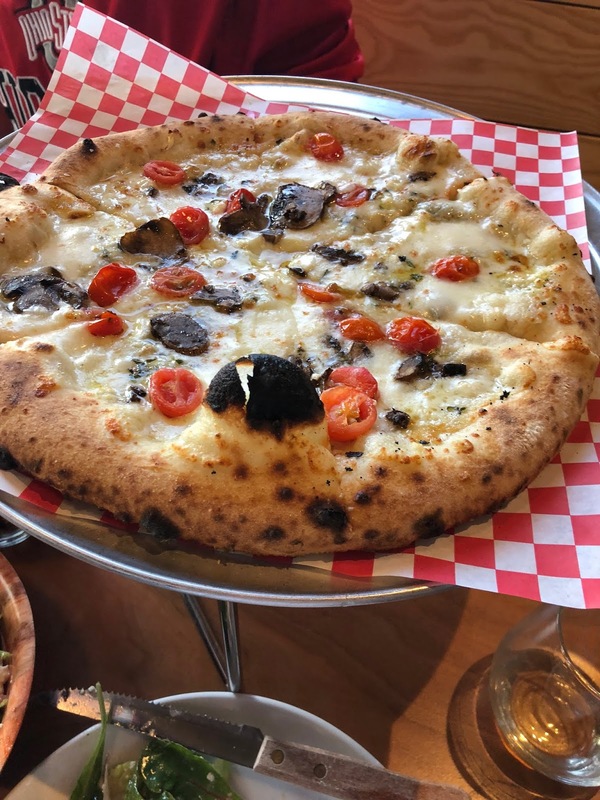 It is topped with mushrooms and roasted cherry tomatoes. It was really, really good. 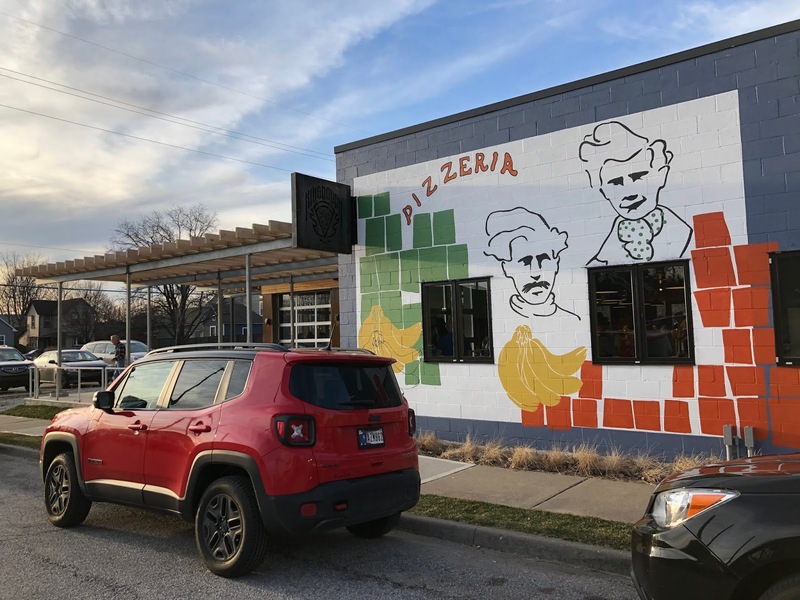 Even my son who claims to not like pizza most of the time (he was ruined for pizza in Indy when we were in Italy) really enjoyed it and said he would happily eat it again. 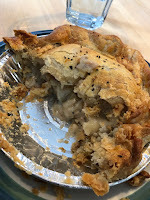 It had a nice kick from the goat cheese and blue cheese and the crust is thin and bubbly on the edges and is just the right chewiness that makes you want to eat every bite of it. 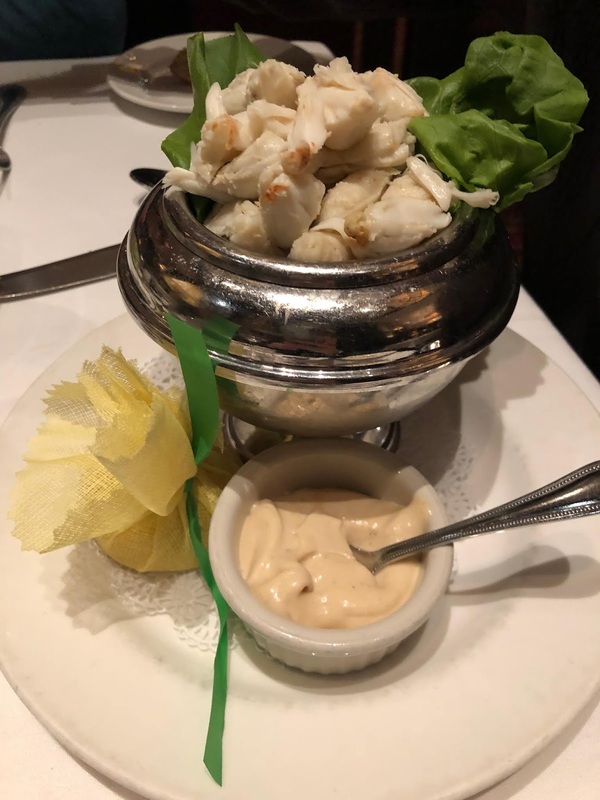 Loved it combined with the acidic salad. 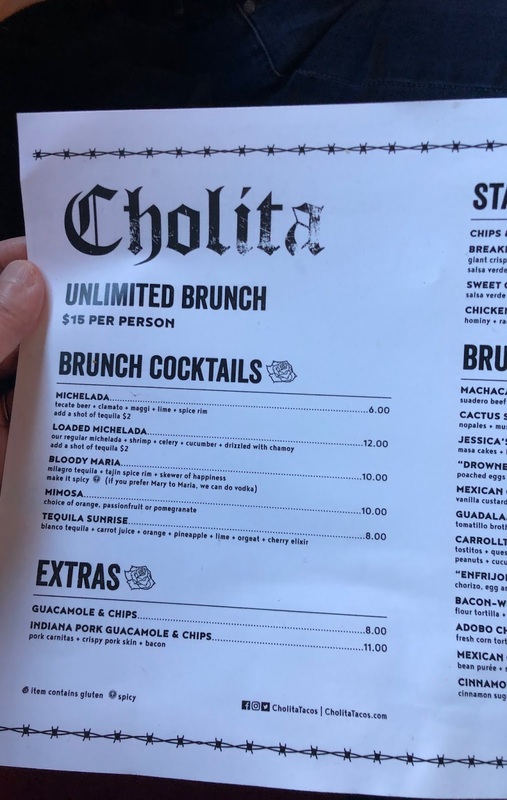 There are lots of good combos on the menu though—and honestly, I bet the simple margarita is delicious too. 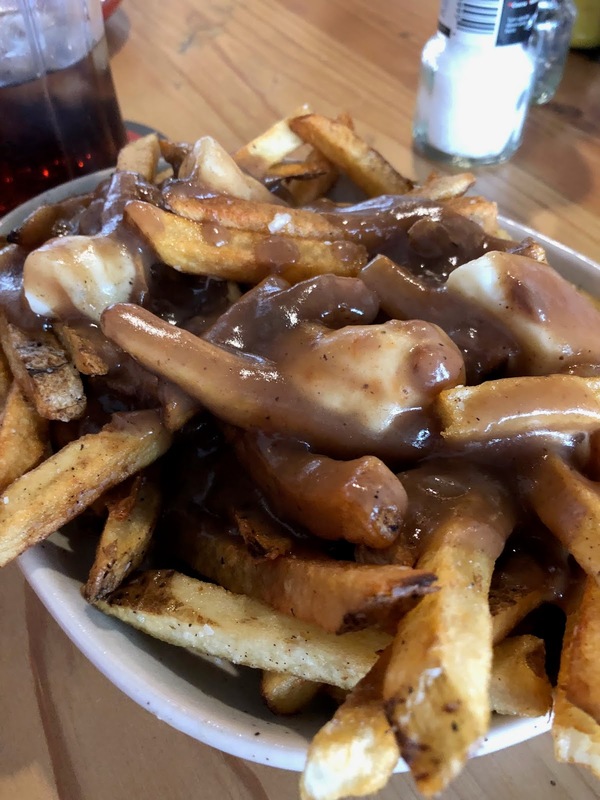 Hubby has plans for bringing more people next time and also getting one of the meaty ones (even though he really wants the stinky pete again too). I would also like to come with a larger group and try more of the appetizers as well. So, I will say, it is a place that lived up to the hype and will definitely go into the rotation for us. They don’t take reservations though, so prepare for a possible wait. The food turnover is fast though, even when the service is really slow, as it was for us (you will get food, you may just not be able to get a drink). I recommend having enough people to order a bottle of wine so don’t have to wait if you want another drink. All in all, it is one of the best new places we have tried in a while. Oh, and let me know your favorite pizzas here! 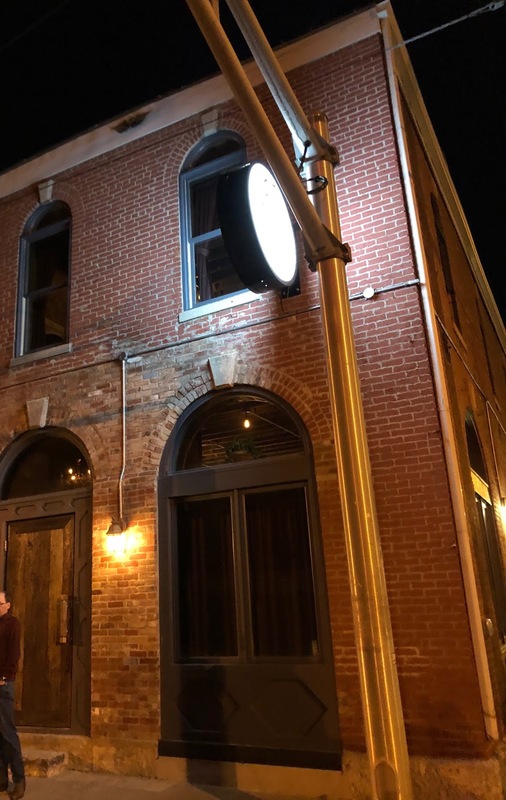 Geraldine’s is the newest restaurant from Dan Jarman, of Fat Dan’s fame. Totally different type of place, completely different vibe for sure. 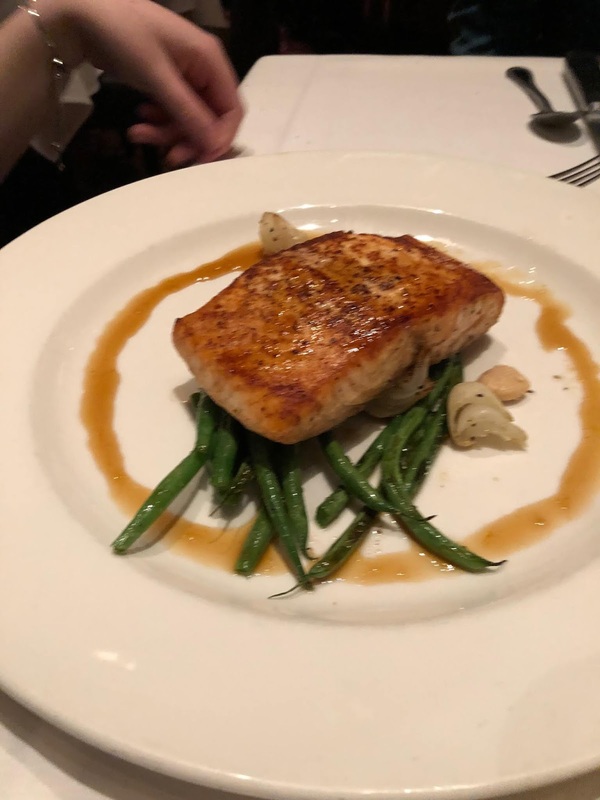 So this is a tough one for me, because so many people have told me how great the Old Fashioned and the steaks are, and while I really enjoyed several things, those two items happened to be the weak links of the meal. However, there are many things I enjoyed, starting with the atmosphere of the place. Love the old school supper club feel, and the wood everywhere. We also had a very attentive server, even though we might have challenged her with a few of our questions. The first thing we ordered to eat was the housemade Gorgonzola potato chips ($11). 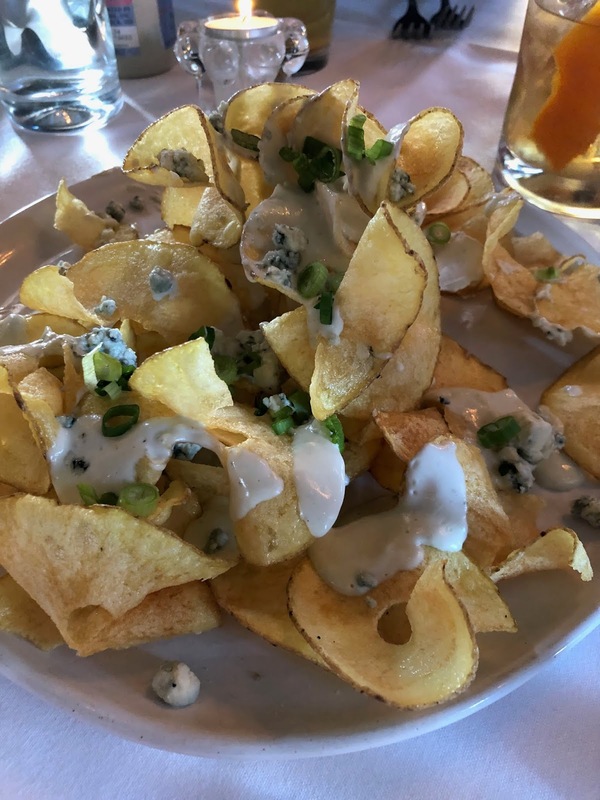 So they are super thin, super fresh potato chips that are drizzled with a blue cheese creamy sauce and chunks of Gorgonzola. The chips reminded me of those ones you get at the State Fair that are like a long thin layer all off of one potato. These were really good and went down a little too easy. Honestly, they ended up being one of my favorite parts of the meal and I sort of wish I had eaten more of them. Before we got the appetizer though, they brought us a banana sorbet palate cleanser. It was tasty, but I think I would have preferred it before the main course. 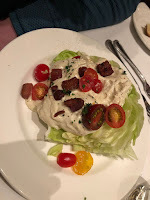 Next, we had a salad course—hubby and I split a wedge salad ($11). It was fine. The smoky whole piece of bacon was delicious. I think the dressing was likely the same sauce used on the chips, but because it is kind of thin, which makes it good on the chips, but doesn’t stand up quite as well to a big hunk of iceberg. And there wasn’t nearly enough of it, so we got some extra on the side. The bacon was delicious. The rest was fair. 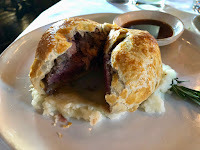 My sister had the beef wellington ($34), which is a filet with mushroom cooked inside pastry. 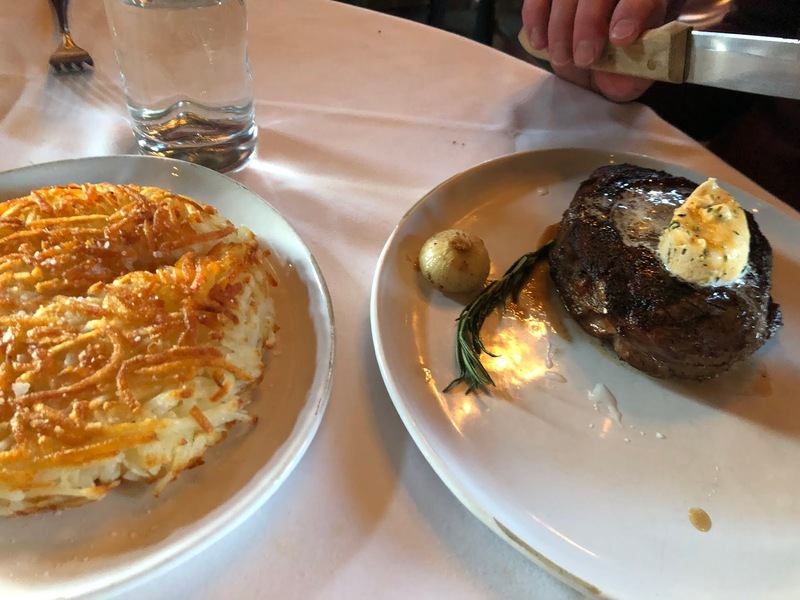 This was definitely the best of the steaks on the table—the filet was fairly tender, although I think cooked a little more than was ordered. It was good, and it’s nice to see this old standard on a menu. It just didn’t blow my mind. The two men at the table had the 14-ounce ribeye ($40) with the addition of herb butter. They were not super impressed with the steak, and the bite I had was so fatty, I had to spit most of it out. 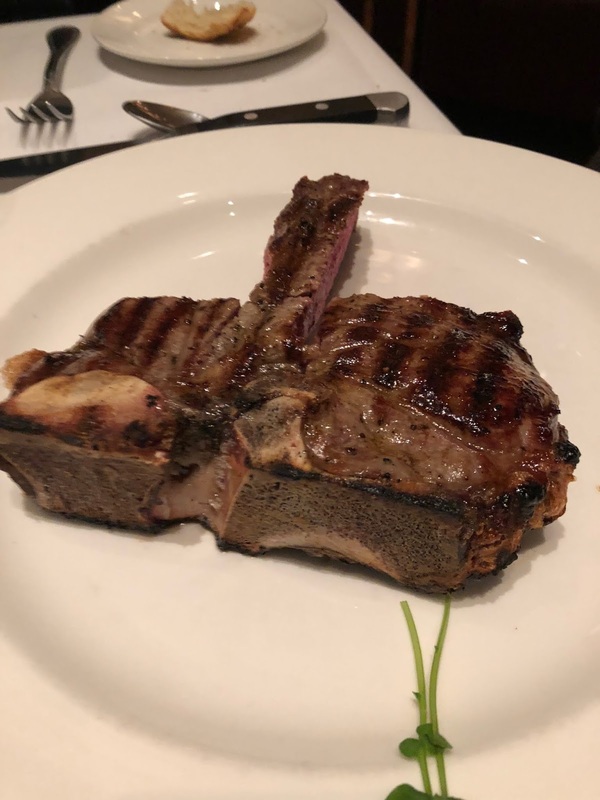 Maybe you have to stick with the dry aged steaks or something, because everyone has told me the steaks are great, but this one did not impress any of us. We had a side of the crispy hash brown wheel (how could you say no to that?) 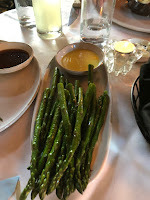 ($10) and sautéed asparagus ($12). The outside of the hash browns was yummy—very crispy and well salted. There was just a little too much of the soft non-crispy bits on the inside. But I am being picky—I like my hash browns as crispy as possible. Maybe deep fry the whole thing…who knows. 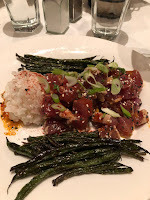 So, since I was going to share the beef wellington, I got the seared ahi tuna appetizer ($15) as my main. This was delicious. 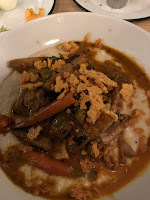 One of the best versions of this simple straightforward dish that I have had. 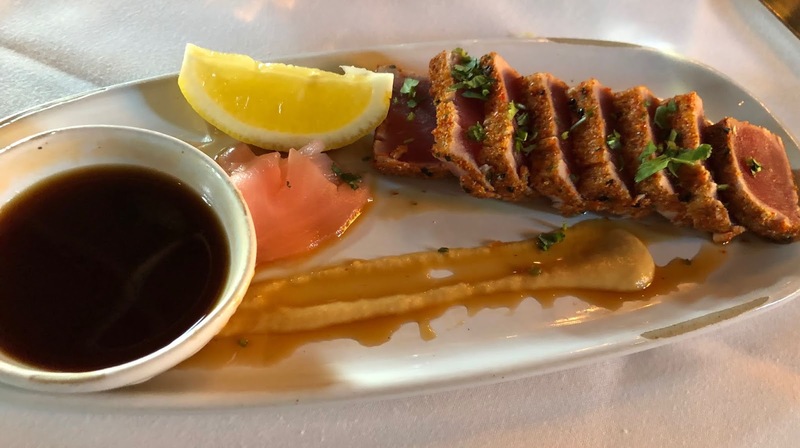 The tuna was really high quality and cooked just right. 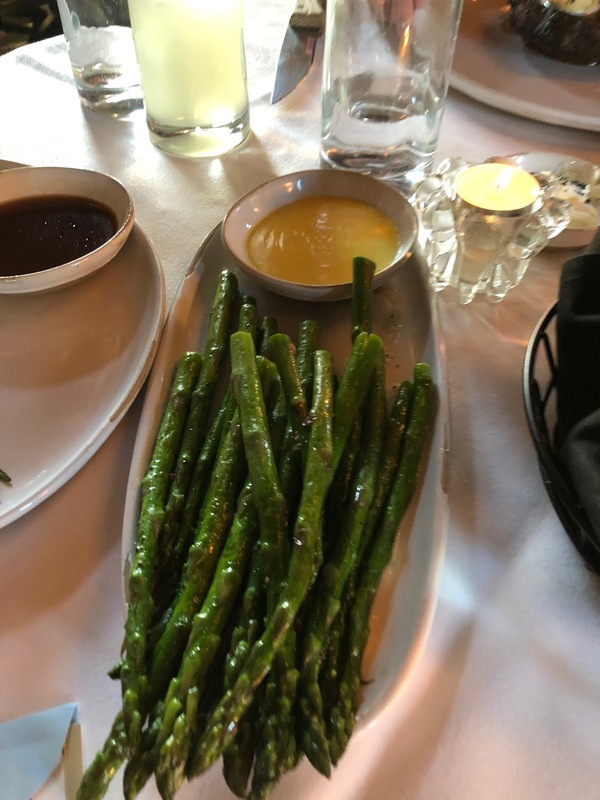 It was served with a soy dipping sauce and a mustard sauce on the plate. I could pass on the spicy mustard, but I really enjoyed the soy sauce. It was a really nice dish and a good accompaniment with all the rich heavy flavors of the steaks. We were celebrating my sister and her husband’s birthdays, and they must have heard us say “happy birthday,” because they started the end of the meal by bringing us a free dessert consisting of a chocolate bon bon, chocolate dipped strawberries, and some caramel meringues. This was really good. The dark chocolate on the strawberries was bitter and just right with the sweet strawberries. 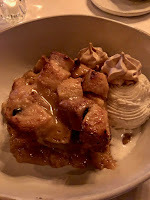 We also ordered the sticky toffee bread pudding ($12) to share at the recommendation of the server. This was really tasty too. We love bread pudding and sticky toffee pudding, and this was a great combo of the two. Plus, more of those caramel meringues, which were one of my favorite things…. I need to make these. I love the texture of meringues, and the light caramel flavor added to them and was somewhat unusual (and delicious) for a meringue. But back to that drink. It was an old fashioned that was watered down with soda or water. You could tell they just wanted the glass to look full, but hubby wasn’t a fan. I saw a video on twitter of the bartender making the same drink, and the glass was not full. So maybe another bartender with his or her own style…who knows. The wine pours on the other hand were generous. The wine list was small, be what we had was good. 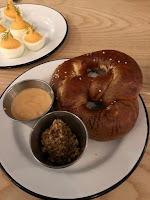 All in all, I am still somewhat intrigued by this place—I like the vibe of it, and some of the things (appetizers mainly, and the dessert) were really good. I might make a light meal of apps—there were several more I would like to try. If I were going to get a steak, I might just stick with a straight filet. The service was very friendly and efficient as well. But since everyone else has told me nothing but good things… share with me what you have had and liked. 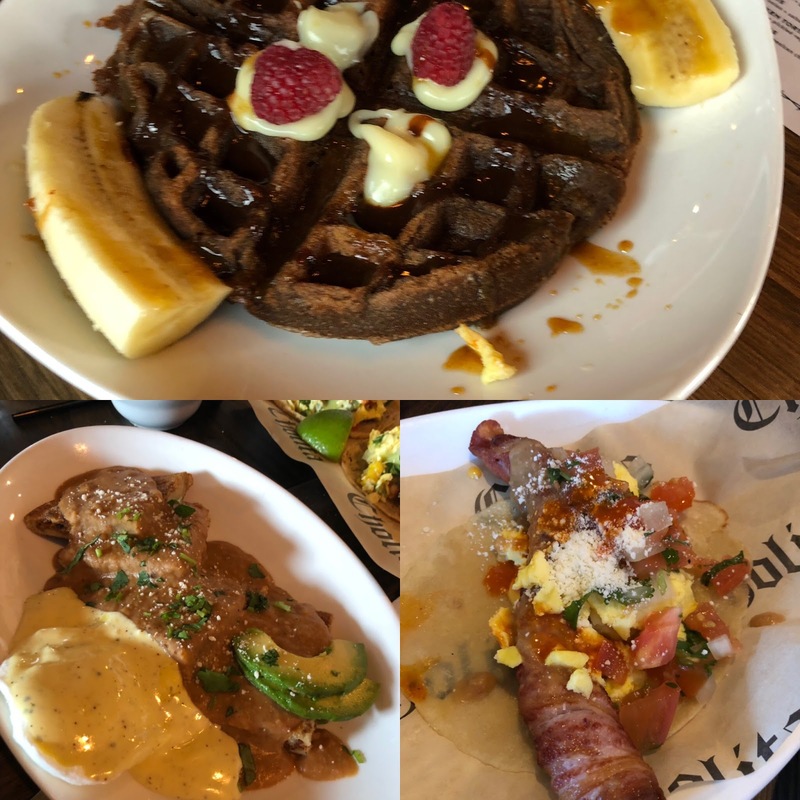 I know it hasn’t been that long since I wrote about this place, but I feel like it is my civic duty to inform you all about their Sunday brunch. So, it’s $15 and it’s all you can eat. And it’s not a buffet, but you order off the menu. 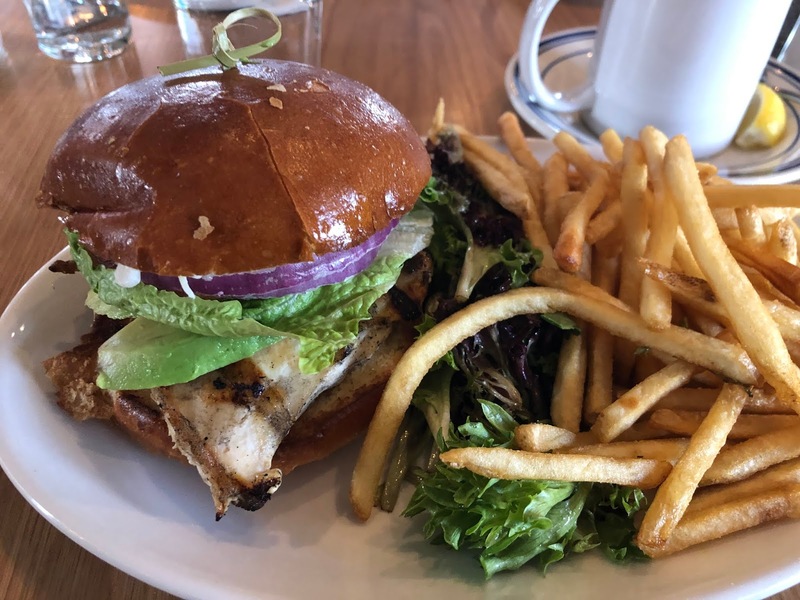 It is a different menu than their usual one, and actually it has even more choices. I have been twice already and have tried a lot of different things because both times I was with several people. They have some drink specials including several flavors of mimosas ($10). The first time I tried the passionfruit mimosa, but I stuck with margaritas after that. The mimosa was mostly just a glass of sparkling wine with some passion fruit syrup that sort of sunk to the bottom and never really mixed in well. Their margaritas are quite good though. 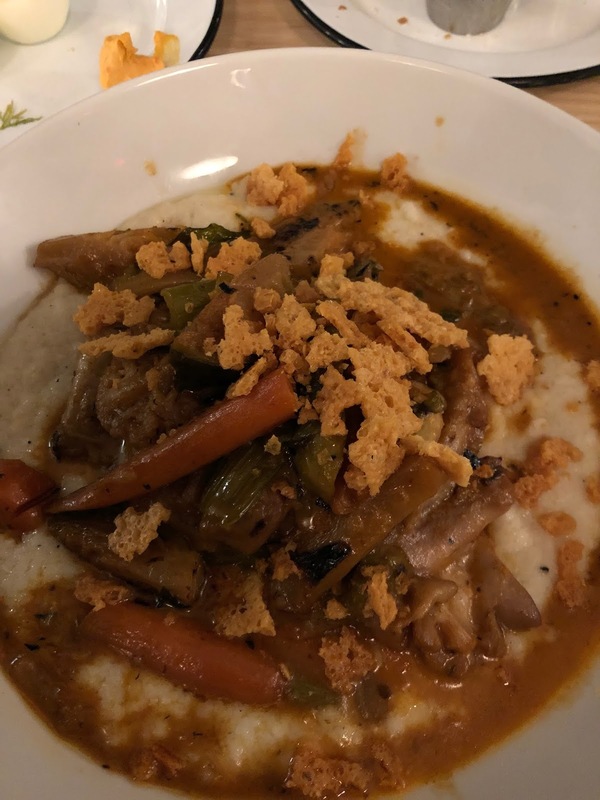 As far as the food goes, it was mostly all good, and some things were exceptional. My favorites are probably the chilaquiles and the tlayuda. 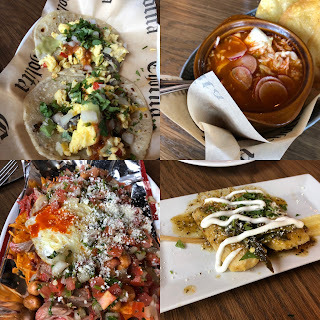 The chilaquiles are made with nacho cheese Doritos and they served them in the split open bag—the chips at the bottom with cheese, bbq carnitas, boiled peanuts, pico de gallo and a fried egg. 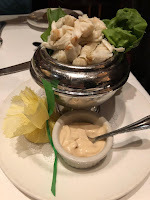 This was a popular choice at the table-- hubby especially liked it. It is definitely on my must-order list here. The tlayuda is a good thing to split with a group, otherwise it might fill you up too fast because it is big. It’s like a Mexican-style pizza—the crust is a giant crispy tostada topped with cheese, seasoned ground chorizo, scrambled eggs, beans, crema, salsa verde and pico. It’s really tasty. The first time I had it, I brought leftovers home to hubby and my son and they ate it immediately. A good mix of various flavors. And if you order a side of guacamole (it’s $8 though, not included in the all you can eat price), you can put some of that on top too. Speaking of guacamole, they have certainly improved it since my first visit. I felt like there wasn’t a lot of it when we went the first time and that it was mainly a lot of pico. But now it feels like you are getting a full serving of it. You can get chips and salsa as part of the $15 and their salsa is good. It is fire-roasted and has that deeper flavor that comes from roasting the tomatoes and peppers. I recommend getting some to add to various other dishes as well. They serve those homemade fried flour tortilla chips, which I particularly like, even if they are a tiny bit greasy. Hubby loved the bacon wrapped hotdog, which basically comes served as 2 tacos with the hotdog, beans, cheese, egg, guac, pico and hot sauce. I will admit, it was pretty darn tasty and not something I would typically order. It had a nice breakfast flavor with the eggs, bacon and pork. If you like sweets for brunch, the chocolate waffle is darn good as well. 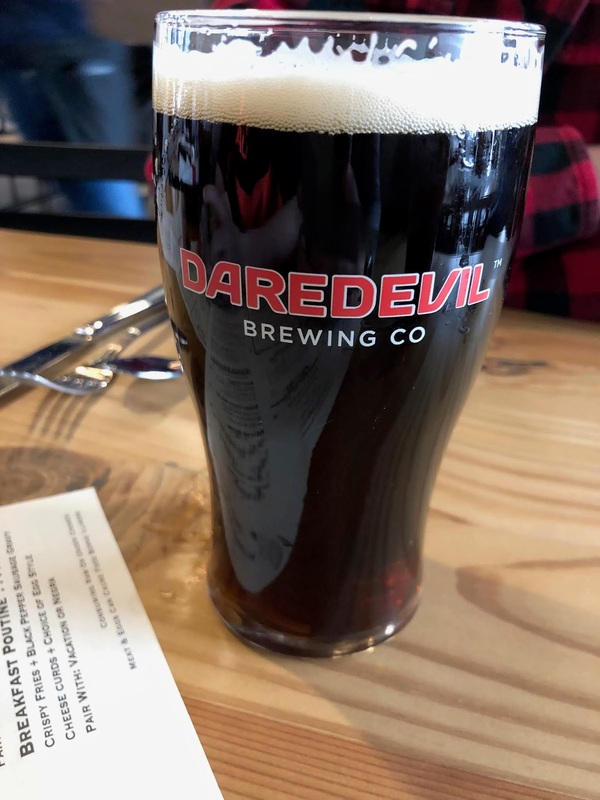 I had to be forced to take a bite because I usually avoid sweets for brunch, but I was really glad I did—it is really rich and chocolatey, with just a little bit of spice in it. It has dulce de leche, vanilla custard and banana with it. A great combo. They should add this to their dinner menu for dessert. You can also get churros, and they were better the two times I had them as part of brunch then the first time we had them for dinner. 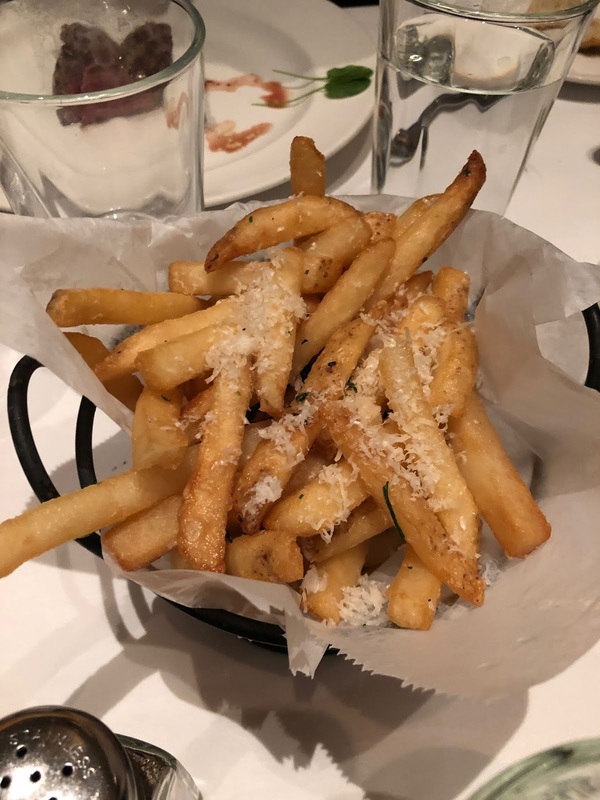 I think they have perfected the fry time on them and they are crisp outside but still slightly soft inside. And they have caramel and chocolate drizzle underneath. 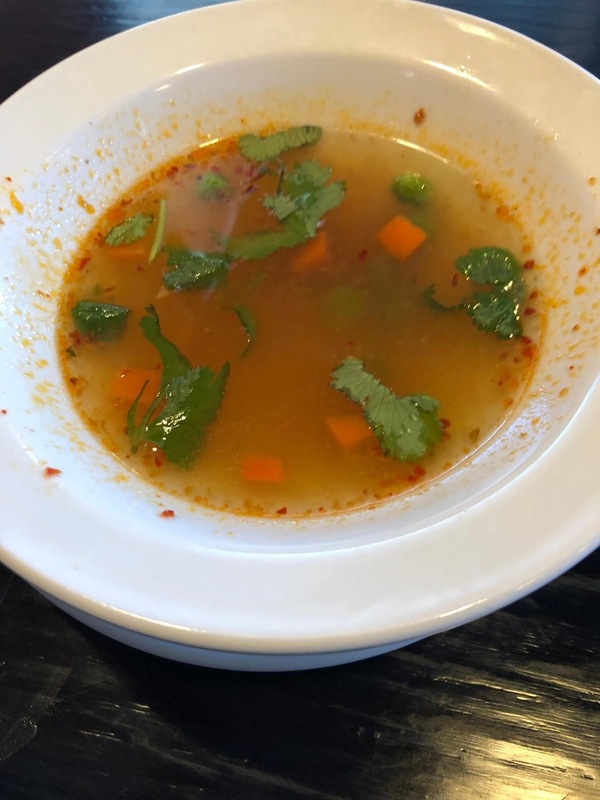 Back to savory though, I also enjoyed the pozole soup much more than I thought I would—the spicy chile broth was so tasty—it has a smokiness to it and a depth of flavor that was really spicy, but not hot spicy. There is chicken, hominy, cabbage and radish in there too. And they serve it with big fried tortillas. Seriously something I wouldn’t have probably tried but was glad I did (and it was thanks to our server who brought it when we told her to surprise us with a couple of things). The other thing she brought us was the drowned eggs, which I have now had both times. These were poached eggs cooked in tomato chipotle salsa with chiles, cheese and crema. I liked this as a very flavorful option with less carbs than most other things. You really got the smoky flavor from the salsa and they know how to poach an egg here. They were all just right. There was also a poached egg on the carnitas gorditas, which were pieces of masa cakes with beans, cheese and some sliced avocado. There was a verde hollandaise as well. It was sort of their version of an eggs benedict. 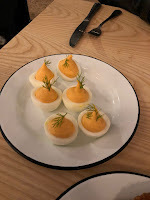 I liked the flavors here, and again a nicely cooked egg. This was one I was torn on-- the masa cakes were strangely hard to cut, but you could bite through them. The flavors were good, but they were just maybe one of the weaker choices. 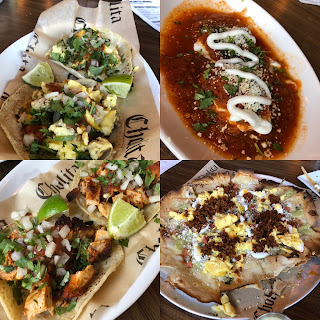 I also tried the chicken and cactus and egg tacos. Both are good, especially with some of the salsa on top, although compared to the rest of the things, they are maybe slightly less exciting. The only thing I had that I just did not like were the tamales. They are pretty dry. They do have various sauces drizzled on top, but it isn’t enough to make up for the dense dry interior. 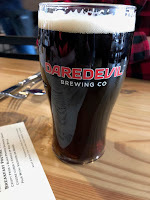 It had been awhile since we’d been Ale Emporium, and recently I bid on a gift certificate at a fundraiser and won, so it was a good time. Our gift card was for a large pizza and large wings, so we grabbed some friends and went. They have so many flavors of wings, but we decided to just stick with the classic buffalo version. I like that they give you a good mix of drumsticks and flats, because hubby and I really like the flats. I can’t say there was anything particularly exceptional about them, but they were solid wings. I sort of wished for a bit more buffalo sauce—it was mainly on the bottom of the bowl and they weren’t tossed too much. 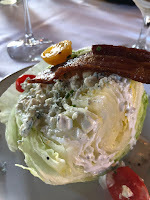 The blue cheese dressing was really tasty. We also had some ranch, but I stuck with the blue cheese. 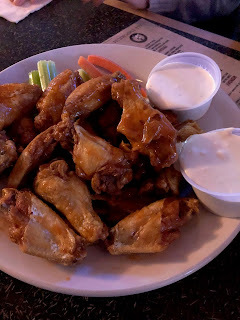 (Wings are $8 for 1 pound, $15 for 2 pounds and $26 for 4 pounds). 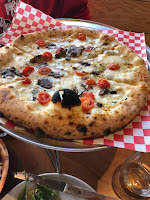 The pizza was more of a fan favorite—hubby really liked it. 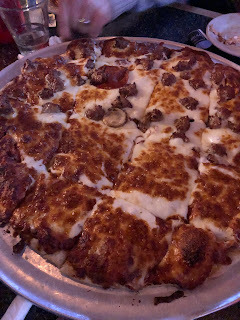 We got the thin crust, but it was still pretty deep with toppings…not really what you think of as “thin.” On half we had mushrooms and red onions (my choice) and the other side we had mushroom, red onions, pepperoni and sausage. It is really, really cheesy—they put a ton of cheese on their pizza. So this is kind of a preference thing. Hubby and one of our friends really liked it. It had a great taste, but almost a little too much cheese for me (I know, that sounds crazy). I just feel like the cheese gets a little gloppy, especially after it has cooled a bit. Hubby on the other hand, was talking about that pizza all night. He also really liked the sausage—he said it had a lot of flavor and was just the right size pieces. I did like the flavor of the sauce for sure. The whole thing reminds me of a more old school pizza flavor if that makes any sense. I couldn’t really eat more than a couple of pieces though with all that cheese—like I said, it is almost a deep-dish version of a thin crust pizza. Service was fast too. The place was completely jammed, and we were on a deadline for an event afterwards and it all came out with more than enough time to spare. Our server was super friendly, and we got drink refills quickly. And if you like your beer nice and cold, this is the place for it. No kids allowed in the Castleton location jut FYI. Clearly, they are no hurting for business based on how huge it is and how busy it was. Nice to see an old school independent place still doing so well. But what are your favorite items here? I am not sure I am sold on eating the pizza or wings a lot.